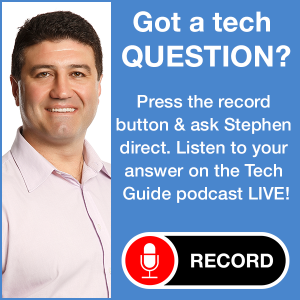 Tech Guide is edited by Stephen Fenech – a journalist with more than 27 years experience. Before creating the Tech Guide website, Stephen was the national technology writer for the Daily Telegraph and the News Limited newspapers around the country. Back in 2003, Stephen had an idea for a technology liftout that was designed to appeal to people who didn’t know much, if anything, about technology. The section became a reader favourite and expanded around the country. Today Stephen is one of the widely read and highly-respected technology writers in Australia. Stephen has brought that concept to the internet. Tech Guide has been designed to appeal to readers of all ages and tech knowledge so they can be updated and educated about the latest trends, products and information. You can even get advice on the best product for you with the Tech Guide Forum and you can even email Stephen directly to get his advice. Stephen can also be heard on radio on stations including 2GB, 2HD, 2HC, 2NM and 2UE and is also the resident tech expert on Studio 10 on Channel 10. He can also be heard on two of the highest rating weekly podcasts – Tech Guide and Two Blokes Talking Tech. If anyone wants to know anything about technology and wants to find the products that’s best for them, direct them to Tech Guide – the place to be UPDATED and EDUCATED. Additional content for Tech Guide is provided by Emad Raad, professional photographer Chris Oaten and technology commentator Trevor Long. Tech Guide is a division of Sharky Media Pty Ltd.